One of our own has published a book of stories about some larger than life Babb’s who migrated to Texas in the early years. The book is available here on Amazon.com. 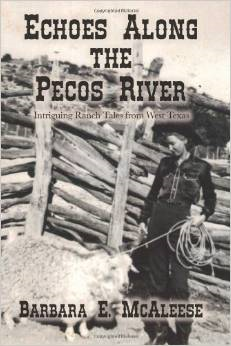 Echoes Along the Pecos River (by Barbara E. McAleese) is a vivid history of five generations of the Babb family who ranched in West Texas. They survived it all through good times and bad, drought and loss, murder and danger, but always protective of their family and those dear to them. The story begins with my infamous great great grandfather who claims he killed 23 men but never went to jail for long. It includes my hardworking Christian grandmother who would lose three children, one who served and died in World War II, including his letters he wrote home. Throughout their lives there was love, laughter and always intrigue of some kind. The story includes my childhood memories, extraordinary tales full of adventure of all kinds: runaway horses, snakes and horned toads. I just finished Barbara McAleese’s “Echoes Along the Pecos River.” Well done, Barbara, and a great addition to the library of Babb books! The five generations of the family members Barbara describes experienced good times and bad times in interesting and always active lives. Thanks for sharing their stories with us.